Over 56 percent of Apple’s petitions are duplicative, in that they challenge at least one claim that is the subject of attack by another Apple petition. Microsoft is even higher, at 59 percent. Samsung, Google and LG have 38 percent, 38 percent and 34 percent duplicative petitions, respectively. 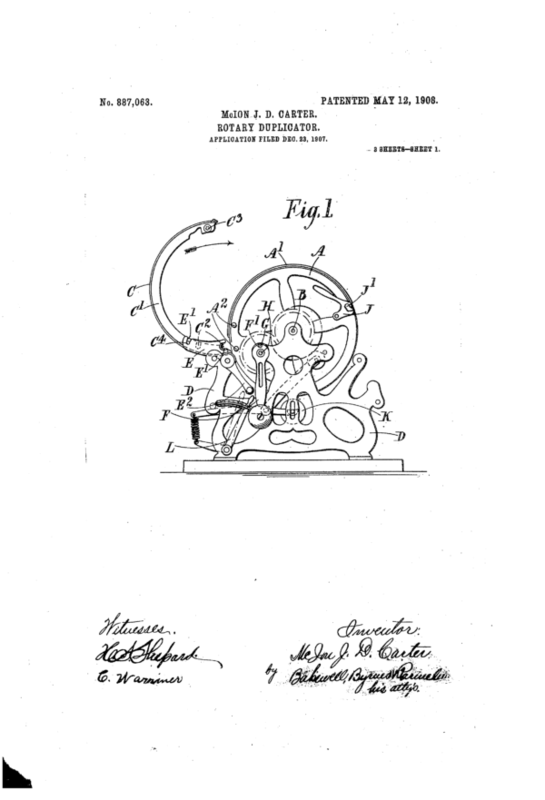 This blog is just so anti-patent. There are people on here that appear to be paid anti-patent bloggers and the blog supports the notion that professors are actually doing scholarly work and not paid by large corporations to publish their “articles” in non-peer reviewed “journals.” Etc. This blog is definitely a large part of the problem with the American politics. Even too funny that one of the blog administrators tells us he works on ethics while at the same time ignoring the structural absurdity of having professors being paid to write articles and universities likely hiring and promoting professors for their anti-patent views. Etc. I appreciate the image of the 1908 Apple corer/slicer. My kids love that invention and use it all the time (I prefer a sharp knife myself). From 1908 to 1925 Mr. Carter had exclusive rights to it. Imagine the consternation as he charged $500 per unit and the middle class consumer was deprived of this convenience. But it did not last. For the past 93 years there has been unfettered competition to deliver Mr. Carter’s invention at the best value to the consumer. In the modern debate, this dynamic is lost. The dominant attitude is that we should not have to wait 20 years, but instead should have immediate access to the inventor’s fruit (pun intended). Our short term appetites have destroyed patent protection and the incentive for inventors to come up with better solutions. The “I want,” as in, “I want to copy” is a strong impulse and a constant source of Kool Aid in the computing arts (as a main part of the propaganda of such anti-patent sites such as Ars Technica, Slash-Dot and Tech-Dirt. There is a veritable, “that belongs to the commune” vibe that seeks to place any improvement outside of the functional protections afforded by patents (and in a curious dichotomy, appears “benign” to any protection against direct copying for expressive protection under Copyright). What is misguided in this apparent dichotomy is the fact that certain items have MORE THAN one aspect to them, and the different aspects garner different protections under the different intellectual property laws. The SAME people that (apparently) are “OK” that software is more than “just math” in order to garner copyright protection — as everyone knows that one cannot obtain copyright protection ON “just math” or “logic” — are the same ones that fight tooth and nail against the protections for utility. The “modern debate” is inte11ectually DISHONEST when this dichotomy is not addressed. Who has space for that kind of cr@p? The article provides its expectation that the PTO will likely become even more aggressive at limiting this approach of repeat filings. I do not see anything in the article that makes this claim. What am I missing? (1) I would be delighted if the PTO were to be more constrained about its approach to multiple petitions filed against a single patent, but even if this PTO director were to impose such restrictions, the next one could reverse that policy fairly easily. PTO directors rarely last more than ~2 years of late, so I would expect such a policy to be fairly limited in duration. (2) The reason that I would expect such a policy to be reversed is grounded in a fairly crude public-choice reasoning. The PTO collects fees for every petition filed. The PTO likes to collect fees. Therefore, unless and until either the Congress or the CAFC steps in to preclude such a practice, the PTO’s incentive is going to be to allow multiple petitions against a single patent by a single (deep pocketed) petitioner. Greg, the amount collected for IPR fees is a minuscule % of the PTO budget, and none of the APJs get any of it for more IPRs, just more work, and they do take up a lot more time than examinations of applications. IPRs… take up a lot more time than examinations of applications. Granting that instituted IPRs take a lot of time, the mere act of filing a petition requires a fee, and it is not clear to me that non-institution consumes all that much bandwidth. True, and non-institution decisions ARE increasing, which does not support an argument for increasing plural petitions against the same patent claims. The fees are split for institution vs. non-institution. Plus, pretty sure that the amount of work for an institution decision is significant. In theory one may see as to why that might be true. In practice, one cannot see as to whether or not that is true because the institution decision making process is opaque (as well as being something pretty much nigh unchallengeable, even as property rights are taken at that point). Aside from Greg’s doubts, there have been many articles written about the problems this “cozy” relationship engenders. I think there is information about the number of points they get for an institution decision that indicates they get quite a bit of time. Sorry but “awarding of points” does not help the argument. See the historical RCE gravy train. So again, what you say has a certain “logical” appeal that is simply not ascertainable in practice. What Paul is saying is right. The PTO is not keen no more IPRs particularly. They probably are the most stressful part of the PTO’s work as they have deadlines and the work can be examined by the CAFC. a single patent claim. Litigants should not count on this practice being approved. …[C]autious challengers might prepare for tightening of the gate by the PTAB. As noted by Lode Runner, petitioners who can afford the cost will often be able to construct multiple arguments for invalidity based on different combinations of prior art references. The page limits on petitions, however, may prevent these different arguments from being presented. The various petitions against a single claim can be joined by the PTAB as long as the case is pending (a written decision closes the window with respect to that petitioner). Likewise, multiple pending petitions can save the petitioner time should one of the petitions be rejected. This isn’t “multiple bites at the apple” but rather more like taking a bigger bite at the same apple. The estoppel risks against the petitioner are also greater so it’s not a “freebie” necessarily. Given the paramount interest that the public has in ensuring that invalid patents are expunged from the system, I don’t think it would be fair or wise to limit petitions in this manner. If the process is genuinely being abused (e.g., frivolous petitions) that’s another story entirely. I’m going to go way out on a limb here and guess that Apple and Microsoft are both fairly successful at cleaning up the system (at least with respect to other people’s junk). Maybe this is OK if they are seen by the same panel. I think with KSR and multiple panels that any claim can be invalidated as the statistics bear out. That “page limits” has to go. Petition fees based on number of pages. I suppose that’s an option, although I like to stay away from those things that drive towards a “Sport of Kings” environment. This proposal seems to miss the point of IPRs. The idea behind IPRs is that there are invalidity contests that are so simple and so straightforward that it is a shame to force them into the unnecessarily slow and expensive context of Art III litigation. That is why the IPR statute limits IPRs to (1) 102/103 contests (2) that can be decided in one year or less (3) based only on publicly available documents. IPRs were never intended to handle sprawling, complex issues. If you cannot present your pitch for unpatentability in the current 14000 word limit, then this really is not the sort of question for which IPRs are well suited. I see this less about complexity, and more about simplicity that may also have a volume aspect. It’s a bit of strawman to constrain the issue into a “complexity” narrative when it does not appear that anyone is arguing such. Complexity has nothing to do with it. The limitation in the AIA that IPRs can only be based on patents and printed publications follows the historical limitation for ex parte and inter partes reexaminations. CBM and PGR do not have that restriction, and they impose word limits (although their limits are about 30% higher than IPR). In fact, I would argue that the increasing complexity of challenges is one of the reasons IPR exists; the PTAB, despite its flaws, is almost invariably a much better place to litigate a more complex invalidity issue than trying to present it to a lay jury. Moreover, I also have no idea why you would equate the limited grounds of invalidity (103/102 printed publications) with less complexity. Printed publication art is typically much more difficult to present to a lay jury than “on sale” or system art, because the outcome turns on technical issues. “On sale” and public use art is usually much more understandable to a jury. With printed publication art, on the other hand, it becomes nothing more than a battle of experts, with the jury deciding the issue entirely on expert credibility without really understanding the substance. Complexity has nothing to do with it. Your point is well taken. “Complex” was a poor choice of words. I think that my broader point still stands. The longer the document, the more time required for the PTAB to read it. The PTAB is working within a statutorily mandated time limit, so if you cannot fit your pitch into 14000 words, then it is probably too time-consuming—not the sort of thing on which the PTAB should institute. Consider the source and realize that Greg has been “cozying up to” Paul as a wanna be IPR cheerleader. A higher fee for more pages in an IPR petition would not deter those few companies already willing to pay plural fees for plural petitions. A more logical change would be to allow more pages where there are more claims in the patent that need to be addressed. I.e., if there is only one claim of concern there is no need for unlimited pages. That’s true Paul, but I am not sure that fee setting for deterrence of action is what is in play here. IF you present more “stuff” which is to be fairly read, analyzed and understood, regardless of how meritorious or how well (or badly) stated, one simply should pay more, as it simply COSTS more, in time and effort to properly assess. I think that the intuition here is correct if one imagines a world in which a lot of stuff will be presented and the PTAB will need to allocate extra resources to process it. In this world, however, one cannot simply pay extra to be allowed extra time for the PTAB to plough through your verbiage. IPRs are statutorily constrained to be completed in a year. In that world, page limits make more sense than a per-page charge. The funny thing about that constraint is that the Office has no constraint as to the amount of resources that it can provide for meeting that statutory limit. IF you present more “stuff”…, one simply should pay more, as it simply COSTS more, in time and effort to properly assess. I wish that this intuition were more common. The whole net-neutrality debate would be rather simply resolved if we were to approach it with the intuition that the consumer who consumes more data should pay for more data (rather than trying to figure out who should bear the cost of extra data consumption as between the content provider and the internet service provider). I don’t know that it makes sense. The arguments you can make at the DC are limited. There are page limits and time limits in DC litigation. Generally, the judge wants to see your best arguments and the rest you are not able to make. Valid reasoning. But, why shouldn’t we expect Apple, for instance, to put up its best arguments and the best art it can find? Surely, if we restrict an entity’s ability to file numerous IPRs against the same patent, then the page limits do restrict the number of arguments they can make. But this approach would force petitioners to put up their best arguments. And if the best argument fails, we can assume that lesser arguments also fail, without having to waste time and money to do so. Why should the Patentee be forced to bear the cost of the Petitioner’s inability (or refusal) to simply present the strongest opposition to the patent once and forever? If I recall correctly, was not the intended estoppel in IPRs supposed to have been geared to that best with the phrase “or could have brought”…? *Also, as LR notes, if the petitions were filed at about the same time to address partially different claims for IPR page limitation reasons, they should have been either denied or combined into a single IPR proceeding. This is a useful dose of perspective, Paul. What we are talking about is a phenomenon that concerns a comparatively small number of patents and patentees. If you own a patent that Apple/Microsoft/Samsung (etc) want to clear out, you can expect this sort of high-powered onslaught. If not, your chances of ever facing any IPR petition is small, and your chance of facing more than one is vanishingly small. I personally think that it is not terribly fair to subject patent owners to this possibility of multiple-petition gamesmanship. In the order of problems facing the patent system, however, this is pretty small beer. It is an injustice that does not affect very many patentees. Think about what you say, in so many words: you only have to worry about IPR-overload if you have a valuable patent. Yes, I think that is true. I happen to think that it is abusive and unnecessary to allow this sort of pile-on. It is empirically true, however, that the pile-on does not happen for patents of low economic value. I would also note that it only happens for some valuable patents. There are valuable patents that receive only 0 to 1 IPR petitions. IIRC, was there not supposed to already be a strong estoppel provision (which the Office pre-SAS was side-stepping by applying estoppel only on implemented claims/argument combinations)…? No, they’re because the Petitioner prefers the lazy shotgun versus the skilled marksman’s rifle. Page limits are just another way of forcing efficiency. A good legal argument should not need hundreds of pages to be made. Petitioners should take their best shot and that’s it. No they’re because of page limits. Brevity is always to be encouraged, but sometimes petitioners simply cannot present their challenges in the limited pages without giving short shrift to key issues, which invites the Board to reject the petition as too conclusory. As for the comment that “Petitioners should take their best shot and that’s it,” that reasoning was basically rejected by the AIA. The estoppel provisions bar petitioners from any arguments they made, or could reasonably have made, in the IPR. So while excessive challenges are never a good idea, the structure of the AIA strongly encourages petitioners to present two independent grounds in the event one fails. And there’s nothing inherently wrong with that, anymore than a patent owner asserting more than one patent in litigation. In practice, that aspect of the AIA seems to have disappeared.